Gentlemen, start your engines! 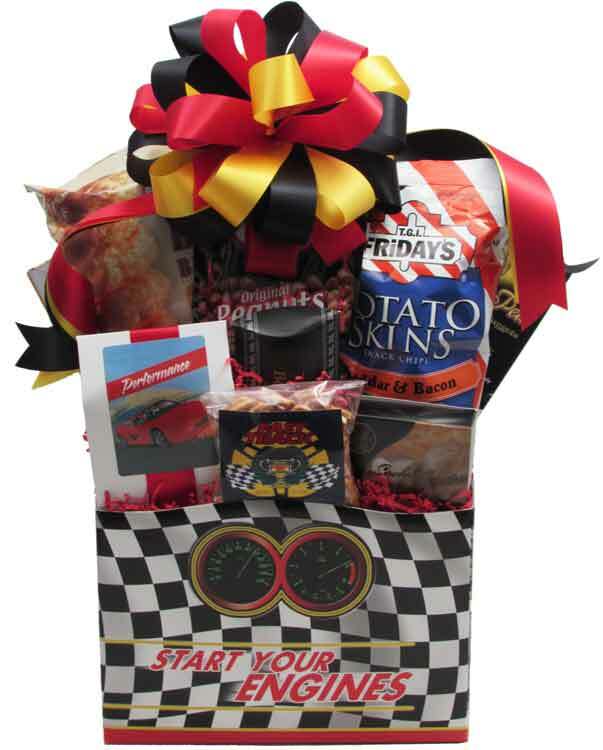 Great for those diehard race fans that have racing in their blood! This themed container is filled full with Natural Smoked Sliced Beef Summer Sausage, "Performance" Raspberry filled Shortbread Cookies (Label has a red sports car on it), "Fast Track" Snack Mix (racing theme label), Cheese, Nuts, two (2) Large Snack Bags (Potato Skins, Buffalo Sticks, Onion Rings, Potato Chips, Pizza Snacks, or other Snacks), Crackers, and Pretzel Nuggets (Honey Mustard) or Pretzel Twists (Salted Caramel or Smoky Barbecue). Wrapped in crisp clear cellophane and topped off with a handmade bow. Includes a handwritten greeting card.